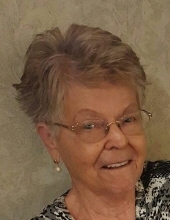 Kathleen M. Michaletz, 90, Algoma, passed away unexpectedly, Friday, March 22, 2019 at home. She was born April 20, 1928 in the Town of Ahnapee to Lorenz and Myrtle (Fowles) Gericke. Kathleen married John Michaletz June 7, 1947 in Algoma. Kathleen cherished the time she spent with her grandchildren and great grandchildren. She walked a three mile loop everyday three times a day for many years. She also enjoyed her flower garden, cooking and baking. Kathleen is survived by her son Kraig Michaletz, Newport News, VA., daughter Kaleen (Tom) Olson, Algoma, three grandchildren Kristin (Adam) Wonsowicz, Jennifer (Zach) Burgess and Brian (Amanda) Olson; seven great grandchildren Addisyn and Finn Burgess, Carson and Jack Olson, and Vincent, Veronica and Victor Wonsowicz; one neice Patty Seiler. She was preceded in death by her parents, husband John and one brother Karl Gericke. There will be a private family service Friday, March 29, 2019 at the SCHINDERLE FUNERAL HOME, Algoma. The family would like to give a special thanks to the Algoma Fire and Rescue, Algoma Police Dept. and the Kewaunee County Sheriff's Office for the quick response to the 911 call. To send flowers or a remembrance gift to the family of Kathleen M. Michaletz, please visit our Tribute Store. "Email Address" would like to share the life celebration of Kathleen M. Michaletz. Click on the "link" to go to share a favorite memory or leave a condolence message for the family.